Try as hard as it might, but J.J. Abrams’ Super 8 simply doesn’t manage to capture the wide-eyed innocence that made early Spielberg movies such as E.T. and Close Encounters of the Third Kind so special . . . It isn’t only George Lucas who tinkers endlessly with his own movies. When Steven Spielberg re-released an extended version of E.T. – the Extra-Terrestrial with new special effects in 2002 he infamously digitally removed the handguns carried by the feds chasing the children on their BMX bikes. Instead he made them carry walkie-talkies. Why Spielberg bothered doing so is a bit of mystery. Critics derided the move as “political correctness” gone mad at the time, but the fact is that E.T. is such a good-natured movie that we in the audience cannot for a moment imagine the feds actually using their guns on the fleeing children. The same goes for Spielberg’s earlier Close Encounters of the Third Kind. In one scene some civilians led by Richard Dreyfuss are gassed with sleeping gas by government helicopters as part of a UFO cover-up. That was back in 1977 and 1982. One can’t imagine the authorities depicted in this year’s Super 8 acting with the same restraint. J.J. (Lost, the Star Trek reboot) Abrams’ much-anticipated Super 8 project is ostensibly a homage to those early Spielberg movies of the late ‘Seventies and early ‘Eighties which featured kids living in Californian suburbs who have to cope with aliens or ghosts. Think of the movies of your childhood such as E.T., Close Encounters, Poltergeist and The Goonies and you get the general idea of the cinematic inspiration behind Abrams’ film. 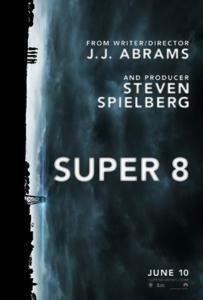 Whether you see Super 8 as a nostalgic homage or unimaginative rip-off of those Spielberg movies is entirely up to you. But the fact remains that Super 8 is a rather mean-spirited retelling of the E.T. story. Here’s the plot in short. [WARNING! Plot spoilers ahead!] It is February 1979 and some kids living in American suburbia witnesses a massive train crash. The train was transporting an alien creature held captive by the U.S. government. Needless to say the alien escapes and soon the kids’ town is overrun by secretive military types led by a shady Colonel Nelec (Noah Emmerich) looking for the creature. Like E.T., the monster in Super 8 only wants to go home. However it has unfortunately been traumatized by the cruel experiments performed on it by the government and spends most of the picture in “a shadowy, destructive rage” as scifimoviepage.com reviewer Brian Orndorf puts it. "What would have happened if those feds did send E.T. off to Guantanamo Bay for a couple of years . . ."
Think of the creature as what would have happened if those feds DID manage to get a hold of E.T. and sent him (it?) off to Guantanamo Bay for a couple of years. Oh, and imagine that E.T. was a whole lot bigger and had more in common with H.R. Giger’s slimy creations for Alien rather than Carlo Rambaldi’s most famous design. In one scene we see the Super 8 alien attack and kill its former tormentors. In another it kidnaps some townspeople including the town sheriff to keep them in its underground lair for food (one supposes). How the times have changed! (a) film-makers such as J.J. Abrams believe that today’s audiences are more desensitized than those of 1977 and 1982, that audiences need more bang for their buck as it were and simply won’t be satisfied after countless X-Files seasons by shadowy government helicopters simply sleep-gassing nosy civilians. One suspects that if J.J. Abrams were ever to remake Close Encounters he’d have those helicopters napalming the civilians and have Roy Neary outrun a flaming fireball! (b) in the wake of revelations about human rights violations and state-sponsored torture at Guantanamo Bay, the American public – or at least Hollywood who makes all these movies – are ready to believe the worst about their own government. Or maybe it’s just the lingering economic recession talking. The fact remains however that Super 8 is too much a product of its own time to capture the wide-eyed innocence of those early Spielberg efforts, which feature that rarity in celluloid science fiction, namely the benign alien. Since then we have all come to believe that the aliens will be just as vindictive as we are . . .